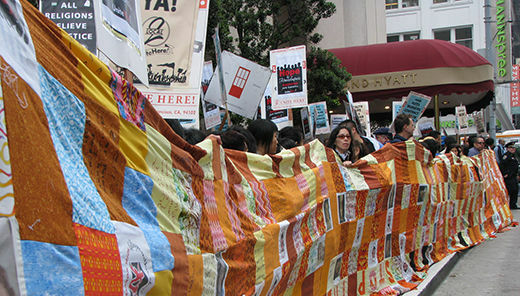 SAN FRANCISCO – Held aloft by hotel workers and community supporters, the Hope Quilt stretched down the block from the Grand Hyatt hotel’s entrance on a sunny October afternoon. Its colorful squares carried the stories of the housekeepers – mostly women – who clean and prepare the country’s myriad hotel rooms every day and the struggles they face as they lift heavy mattresses and cope with growing mounds of fancy bedding, often suffering crippling injuries in the process. Though San Francisco hotel workers and their union, Unite Here Local 2, are negotiating with several hotel chains for a new citywide contract covering some 9,000 workers, hundreds of them gathered at the Grand Hyatt Oct. 7 for a reason. Earlier in the summer, Romero said, the hotel chain had told housekeepers at three Boston-area Hyatts to start training workers the hotel had contracted through Hospitality Staffing Solutions of Georgia. Management said the new workers would be their vacation replacements. Then 98 workers – non-union and mostly immigrant women – discovered their jobs, paying up to $16/hour, were being taken over by workers paid half that much. 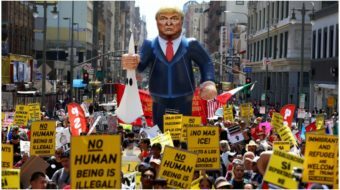 Though Unite Here has no contracts with Boston-area Hyatts, it immediately offered help, organizing demonstrations in Boston and Chicago. Other Boston unions, and Massachusetts Governor Deval Patrick, declared their support for the workers. Hyatt later offered the housekeepers jobs with another staffing company at their old rate of pay through the end of next year, or six months of job retraining. But the workers overwhelmingly turned the offers down, and now the union is calling for a nationwide boycott of the chain. 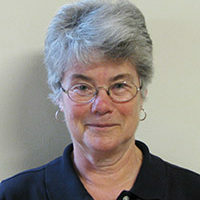 As Romero and other former Boston Hyatt housekeepers told their stories, a wave of support arose from their San Francisco brothers and sisters, who before winning their last citywide contract in 2006, experienced two years of difficult negotiations, a two-week strike, 53 days of employer lockout, and a union boycott. The crowd also heard from workers at the Hyatt Regency Santa Clara in the South Bay, who are seeking to organize with Unite Here.